Harold Hazzledine became the 14th member of the Beeston Old Boys Association to make the Supreme Sacrifice in the Great War. The son of John William & Sarah Ann Hazzledine of 37 Church Street, Beeston, Notts, was born on 10th March 1894. Harold was yet another young man who marched, together with other pals and Captain Stephen Hetley Pearson, to join the Sherwood Foresters. His first posting would be with the either the 3rd or 4th battalions, which were reserve and extra reserve to the 1st & 2nd Battalions Notts & Derby's. The 3rd Battalion was stationed at Plymouth while the 4th Battalion was at Sunderland. Private Hazzledine missed the battle of Neuve Chapelle, when two of his colleagues were killed, but was in a batch to replace the casualties from this battle. He landed in France on 18th March 1915 joining the 1st Battalion Sherwood Foresters just six days later and served in "A" Company. The 1st Battalion joined the 24th Brigade, 8th Division at Hursley Park near Winchester on 2nd October 1914 and, on 5th November, landed in France. They stayed with the 8th Division before a move on 18th October 1915 to the 23rd Division. 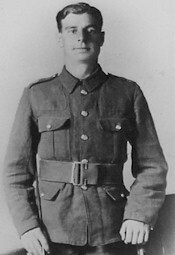 Harold Hazzledine had progressed through the ranks to Corporal by the time of the Somme Battle. On the 1st July 1916,the 23rd Division started their move from Rainneville to Henencourt Wood and then finally into billets at Dernancourt on 4th July. Unfortunately, this journey took a long time, because of road congestion due to other divisions returning back to billets for a rest after the attacks on 1st July. 5th July - The move to La Boiselle and attack on the German trenches - The Battalion reached the barrier on the Albert-Pozieres road, near the Tara line, about 12.30am, and at once proceeded to load up with stokes mortar and mills bombs to take and secure a line in advance of the existing front line. Progress up the communication trench proved very slow owing to the ration and working parties encountered, and to the fact that the G.S.O III 19th Division & Staff Capt 57th Brigade were not at all sure of the way. The Battalion was heavily shelled in the long communication trench. This is probably the time when Corporal Hazzledine was killed. They arrived at last, and took up a position in a support line near the church in La Boiselle. Throughout the action with the enemy that followed the fighting was very severe and mostly hand to hand. "A" Company had suffered very heavy casualties, having continued to attack the work all afternoon. "B" & "C" Companys had made three attacks, and, more than once, had reached their objective, only to be forced back by superior numbers and bombs. A slight counter attack was made by the enemy about 2am on the 6th but was easily repulsed. Shortly after the Battalion was relieved and marched back to its old billets in Dernancourt. Corporal Hazzledine is commemorated on the Thiepval Memorial to the Missing. Thiepval War Memorial to the Missing - was unveiled on the 1st August 1932 by the then Prince of Wales and is the largest British War Memorial in the world. Standing 150 feet high, it dominates the surrounding area. The memorial stands on a concrete raft 10ft thick, built 19ft below the ground, the solution of a surveyor to the problems of building over the warren of tunnels that formed the German second line. Designed by Sir Edwin Lutyens the memorial has sixteen masonry piers, where can be found, on the panel faces, the names of some 72,000 British and 830 South African soldiers who died and have no known grave, during the period starting in July 1915, when the British Third Army took over from the French, through the Somme battles of 1916, until 20th March 1918, the eve of the last great German offensive on the Somme. The focal point of the memorial is the Stone of Remembrance, which lies under the great arch and centrally between the piers. Rudyard Kipling chose a quotation from Ecclesiasticus, "There name liveth forevermore". The Australian Missing are commemorated on the Villers Bretonneux Memorial, the Canadians on the Vimy Ridge Memorial, the Indians at Neuve Chapelle, the New Foundlanders at Beumont Hamel and the New Zealanders at Longueval. Among the names commemorated on the memorial - each important to those who mourn them - are the brilliant musician Lt George Butterworth MC, of the 13th Btn, Durham Light Infantry, killed on the 1st August 1916; Major Cedric Charles Dickens, descendant of the great novelist killed on 9th September 1916; Lce Sgt Hector Hugh Munro of the 22nd Royal Fusiliers, the author Saki, killed by a sniper on 14th November 1916, at the age of 46, in the area what is now Munich Trench Cemetery. Victoria Cross winners commemorated, include Capt. Eric Frankland Bell and Lt. Geoffrey Cather of the 9th RFI, Pte. William Buckingham of the 2nd Leicesters, Rfl. William Mariner of the the 2nd KRRC, Lt. Thomas Wilkinson of the 7th LNL, Sgt. Maj. Alexander Young of the Cape Police, SAF and Pte. Billy McFadzean of the 14th Royal Irish Rifles who, while in a Concentration Trench and opening a box of bombs for distribution prior to an attack, saw the box slid down into the trench, which was crowded with men, when two of the safety pins fell out. Instantly realising the danger to his comrades and with heroic courage through himself on the bombs. The bombs exploded blowing him to pieces, but only one other man was injured. Some unfortunate men "Shot at Dawn", include Pte Cairnie of the Scots Fusiliers, Pte Farr of the West Yorks and Pte Skilton of the Royal Fusiliers. Behind the memorial is a small Anglo-French cemetery, which symbolises the joint nature of the war. Its construction was paid for equally by both Governments and 300 dead of each nation are buried there. On the base of the Cross of Sacrifice in the cemetery is the inscription "That the world may remember the common sacrifice of two and a half million dead here have been laid side by side soldiers of France and of the British Empire in eternal comradeship". The Thiepval Memorial stands near the rebuilt village of that name and can be found on the D73, off the main Bapaume to Albert road (D929), some four miles north of Albert in the Department of the Somme. 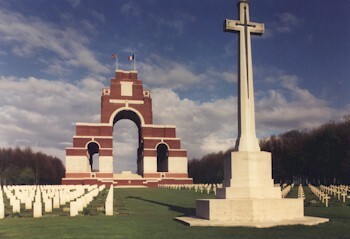 The village of Thiepval was much larger before 1914 than it is now; it was originally abandond after the war. The original register at Mill Road Cemetery, published in 1927 stated that the village of Thiepval had been completely destroyed, the former territory of the commune being distributed among the neighbouring communes. Because only a small element of the village population returned after the war this continued until a later register reinstated the village. The village was attacked on 1st July 1916 directly from the east by the 15th & 16th battalions Lancashire Fusiliers (1st & 2nd Salford Pals). The attack failed with heavy losses; the defenders, the 180th regiment of Wurttembergers, having been garrisoned in the area for over two years, their fortifications were amongst the strongest. Visitors to the area can view from the village church looking towards the Ulster Tower Memorial the battlefield and imagine the field of fire over which the German Machine Gunners, mowed down the attacking battalions. The village finally fell when the 18th Division made a successful attack in September 1916 against the enemy; this attack was approached from the south along the line of German trenches.